While at a medical missions conference I was struck by the imbalance of single men to single women. I have never understood why it is that on the mission field, for every single male there are approximately 10,000 single females. That may be a bit of an exaggeration, but… Why is it that the women will listen to God’s calling and go single, but the men will either not go or will find a wife first? I thought we lived in a culture where men are strong and fear little. Is it fear? Are men not made to go to the mission field single, yet women are? Today, we had an afternoon outing. Along the road we came across some shops that sold sheep skin hats, much like what you would think of the classic Russian winter hat. 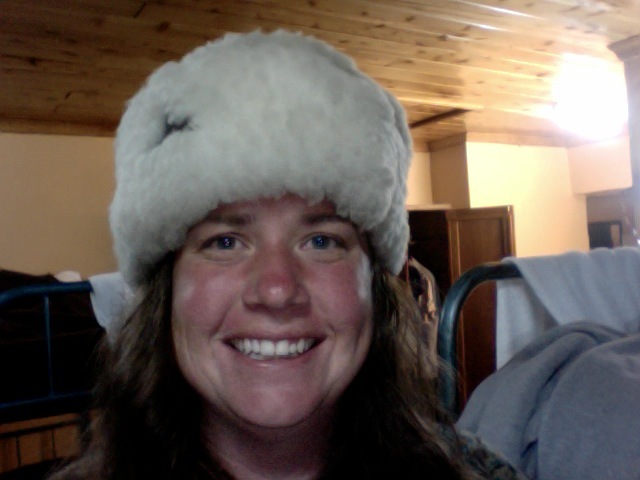 Since it gets so cold in Ethiopia, I thought it would be appropriate to buy a hat. For those of you that don’t know me… I am a very serious person. When I entered the bus, I asked everyone what they thought of my hat and told them it functioned as my husband magnet. One married man suggested I move on to plan B. Another, said it was more like a husband repellant. A married woman suggested that I stop trying so hard and simply place it in God’s hands. Another commented on the lovely Eau-de-Mutton scent. I just don’t see how anyone could resist me with said hat. So, I wore it on a walking safari. While on the safari, I realized that there weren’t any single men and I didn’t want to endanger the marriages of those on the trip, so I took off the hat. Today, was a day that I could joke and laugh about being single in the mission field. It really was fun and the hat was passed around for many people to wear. For many singles, there are just as many tough days where we question what we are doing on the mission field without a husband and when will God provide. Some are better than others at placing their faith in Christ. If He plans for us to get married, he will provide, no matter where we may be. I thought it was due time someone wrote a letter to all the single men that want to go into missions. God has called you. Go! If you are looking for a mate, you will find one on the mission field. You may liken single female missionaries to a pack of wolves, if you get too many of us together. Individually though, we are all quite nice. It is time for you to pull up your big boy pants and Go! I also wanted to let you know that Soddo now consistently has electricity, but it isn’t strong enough for bigger items like the water pumps, so still no running water. As always steph, love to read your writing about your amazing experiences in the mission field. You have great insight and humor that god has blessed you with! I love the husband magnet hat. You really could write a book, a funny book at that. When you meet a guy he better be tough because he’s going to have his work cut out just trying to keep up with you. Love the hat by the way. Love it! Who needs E-Harmony when you can have a husband magnet hat! You never cease to amaze me and make me smile! I honestly love this picture and have no idea how anyone can resist such a cutie that is also such an amazing woman and daughter and friend to everyone she meets. I love you! Your smile is a better magnet that the hat! But save the hat for the cold winter even when you are home. Steph, as a male gynecologist, I have some insight on both worlds (men and women). But can’t speak for all men, but I wonder if the desire of a man for a wife has to do with gaurding himself against sexual temptation while on the mission field. Look at how many men in ministry have fallen to sexual temptation here in the states. I think that paralyzes some men. On the other hand, single women don’t have the imminence of child bearing and so feel more free to go into the field and do God’s work abroad. I do appreciate your humor on the whole subject and I continue to pray for your work in Soddo. Love it, especially the Eau-de-Mutton scent! I can almost smell it now (maybe you can bottle it!). Still praying for you, but I am glad you can still enjoy life amist your surroundings. Hi Stephanie….I love your blogs….very inspirational. It was so great to meet you. My husband and I met you at Jen’s reception in January. Hang in there. I know God has an awesome man somewhere out there.